The humble South Indian thali, may not be as glamorous or calorie-loaded as its North Indian counterpart, but it sure can make lunchtime very special. In legendary and little-known establishments around town, the South Indian thali (also lovingly called meals) offers a filling option to hungry customers. And in almost every instance it celebrates local produce – whether you choose the soft jowar roti or the vegetables cooked in generous amounts of coconut. LBB plates up the best South Indian thalis in Bangalore. The simplicity of South Indian flavours come alive at this popular eatery. Choose any of their meal options and the banana leaves will come out, followed by mounds of rice, and ladles full of spicy sambhar. It will be accompanied by bowls full of avial (a milky, vegetable stew), two other vegetable preparations that are dressed up in spice and coconut, rasam, buttermilk, and thick curd. Nothing will prepare you for the onslaught at this legendary eatery. Your really large thali will struggle to contain the awesomeness they pile on. 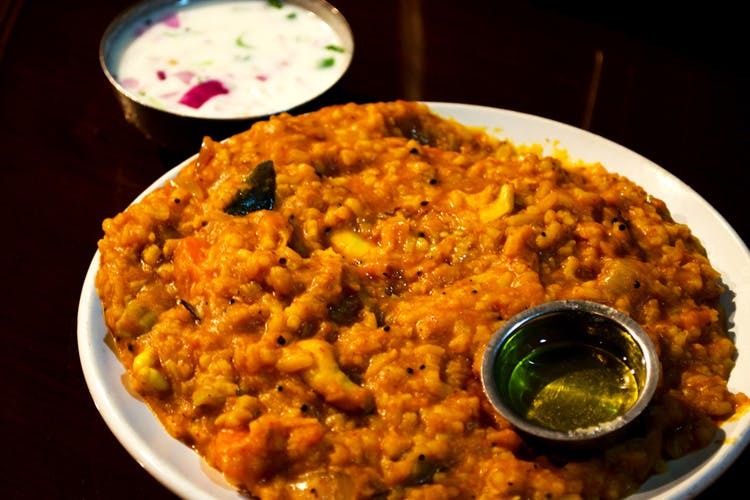 Bisi Bele Bath comes first, after which, the vegetable dishes come trooping in and so do the sambhar rice, sweets, and fruit salad. A highway eatery that has Bengaluru flocking in for its many South Indian treats, the thali offerings are plenty here. We recommend that you go for the Jollada Roti (made from the very healthy jowar) Meals that come with two flaky rotis at the centre of the plate. Around it come spicy chutneys, dals, and thick gravies that go superbly with the light rotis. It’s a celebration of rustic Karnataka flavours. Adored by South Bangalore, Maiya’s sure has taken humble Udupi darshini favourites to another level. Their Combo Meal is topped by two, glistening, puffed-up puris. After this greasy treat, you can set your sights on the rice and sambhar before finishing off with the slurpy curd rice. If you want a light but filling meal then head over to Janardhan. For a little over a hundred rupees, you’ll be served two, large chapatis that you can dunk in a vegetable curry or with helpings of the day’s coconut-garnished sabzi. Next, douse your helping of rice with the flavourful rasam before finishing off on a sweet note, a cup of milky payasam. Formerly known as New Krishna Bhavan, this no-frills establishment bowls you over with its simple but well-done meals. If you come by on a weekday, you can sign up a plated filled with chapatis and a few different spice-loaded curries. There will also be a cup of curd rice that sits next to a sweetmeat. On a Sunday, a touch of special is added to the thali. Deep-fried puris and flavoured rice dishes such as puliyogare — tamarind rice with the added pleasure of crunchy peanuts — make an appearance. A little-known gem, Hotel Nalapaka’s rustic Karnataka meals will make you and your belly very happy. Their Rotti Meals comes with toasty jowar rotis topped with a big dollop of butter. You can wolf these down with their fiery brinjal curry or their lentil preparations. Do come by on Monday afternoons for their specials meals that come with Holige (sweet flatbreads that are stuffed with coconut or soft lentils). Let not the swarms of people at this popular highway eatery deter you from enjoying their meals. You can sink your teeth into their Ragi Mudde meals where the soft ragi balls that pair excellently with the ladles of curry made from greens. We also love their Jowar Roti Meal that comes with the fluffy rotis. Come with a big appetite and you’ll be rewarded at this humble restaurant. Settle in for a meal that’s brims over with flavours from Tamil cuisine. Your helpings of rice can be drowned in spice-filled curries, sambhar, rasam, and parappu (a curry with greens). The lineup of accompaniments includes kootu (a vegetable prepartion), papad, pickle, and a sweet payasam. This is one place where the meals sell as hotly as their fiery Andhra biryani. You can start off by nibbling on the condiments, and then move on to the ghee-drizzled plates of rice. Add generous helpings of the pappu (greens mixed with dal) or sambhar to the rice and you’ll be tucking into a heavenly meal. A thick bowl of curd and buttermilk round off the meal. Read more about Bheema’s meals here.